Today we went to see baseball. Tried to get the mile-high row, but ended up two rows lower. Apparently the row wasn't actually sold out, though, or there were a lot of no shows, because we didn't have any trouble moving up later. 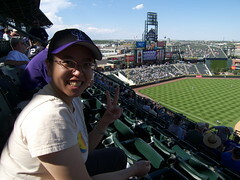 Would have been nice to be on the first base side and see the mountains, but the third base side was better shaded.